The USB 2.0 RG2311 is an OEM USB 2.0 extender for high-speed USB 2.0 connections up to 100m using CAT 5e/6/7 with “flexible power” option to power either the Local or Remote extender modules. This OEM USB 2.0 extender for private label branding is perfect for: keyboards, mice, interactive white boards, flash drives, hard drives, audio devices, USB 2.0 web cameras and any other USB 2.0 or 1.1 device. The USB 2.0 RG2311, intended for OEM/private label, allows users to extend USB 2.0/1.1 connections up to 330 ft (100m) over a single CAT 5e/6/7 cable. This OEM USB 2.0 extender with flexible power provides installers the choice of applying power at either the Local or Remote modules, wherever most convenient. The RG2311 is plug and play – no software drivers required – and works with all major operating systems: Windows®, macOSTM, and Linux®. Additionally, this ExtremeUSB® based extension system is ideal for use with all USB peripherals including: keyboards, mice, interactive white boards, flash drives, hard drives, audio devices, web cameras and any other USB 2.0 or 1.1 device. Consider this OEM USB 2.0 extender with flexible power for your private label brand. Power Supply: 100-240V AC Input, 24V 1A DC Output. Apply at either Local or Remote modules. 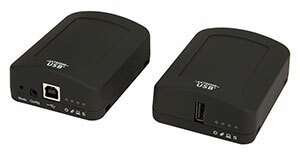 The USB 2.0 RG2311 extender system with flexible power includes the list below. Can be customized for OEM/private label.